Boy, can I relate to that! Funny how I wake up with big plans, then realize storms are on their way and find myself happily beading instead. 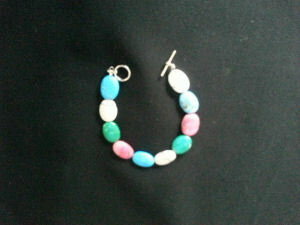 1) This is an 8″ bracelet comprised of dyed pink, blue, white, and green howlite beads with a silver toggle clasp. Howlite, associated with the sign of Gemini, is a calming gemstone, used to stimulate imagination. A soft stone, it can be placed beneath the pillow to counteract insomnia; it’s also beneficial for those suffering from an imbalance of calcium levels. 2) Measuring 3 1/2″ in length, each of these earrings contains four 6mm bright pink glass beads (no I don’t usually work with glass beads, but these caught my eye). They’re separated by daisy spacers, 4mm round silver beads, and interconnected with an antique silver flower. 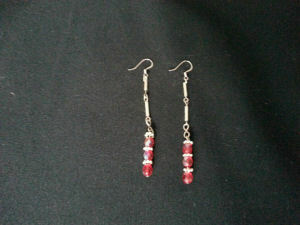 3) This pair of 3 1/4″ earrings boasts three 6mm faceted ruby beads separated by daisy spacers. The bottom portion hangs from a figure 8 connector to the top portion, which is comprised of two twisted silver tube beads. A fishhook ear wire completes the piece. 4) Everything goes with clear crystal! Each of these 3 1/4″ earrings is comprised of three 8mm faceted round beads with daisy spacers. An antique flower connector attaches that part to one 6mm faceted bead flanked by antique silver tube beads. 5) You all know how much I love green, so it’s no surprise this pair is among my favorites. Each earring measures 3 1/8″ long. 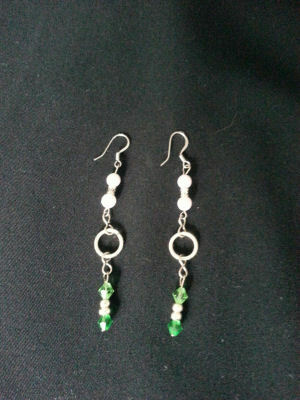 The top portion has two 6mm snow white pearls flanking an antique silver mini-tube bead; the bottom portion has one 6mm emerald bicone, silver spacers, and one 6mm peridot bicone. A silver circle connects the two halves. 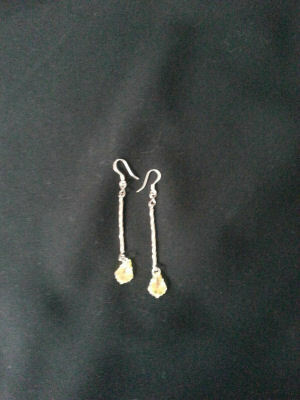 6) I think this pair of earrings looks pretty simple, but the first time I wore them, I got all kinds of compliments. Who knew? They’re 3 1/4″ in length. 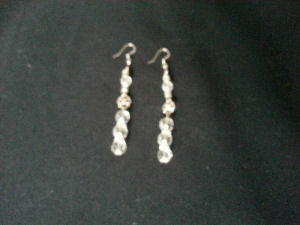 A Swarovski pear-shaped crystal dangles from six twisted silver tube beads. A fishhook ear wire completes the piece. 7) This pair of antique silver owl earrings measures 3 1/4″ in length and hangs from three 4mm rose crystal bicones which alternate with three 4mm round hematite beads. Hematite, also known as “blood stone,” increases intuition and improves oxygen supply to the body. Not to get too weird on you, but Owl, I believe, is my spirit animal, or totem. At least for now. For more information on spirit animals, and to find out which one is yours, here’s an online quiz. This entry was posted in Beaded Jewelry and tagged animal totem, Hematite, howlite, Swarovski crystal. Bookmark the permalink. These are all beautiful. I liked the bracelet since I’m a Gemini. Are you now? No wonder you love words — and are so adept with them! I didn’t know you did this sort of things! Super cool and nice. Now, you must needs make a Patriots one! Oh, dear. You do love those Patriots, don’t you? Is that little mess from last season resolved yet?? Everyone is trying to beat up on Brady at the minute! He makes a good scapegoat, you know. He’s got a NAME and all. Those others were merely minions! Aha! So it is a conspiracy! Debbie, these are ALL such beautiful creations! Like you, green is my favorite color so I really enjoyed #5. I also like how you added the silver circle connections. VERY clever! 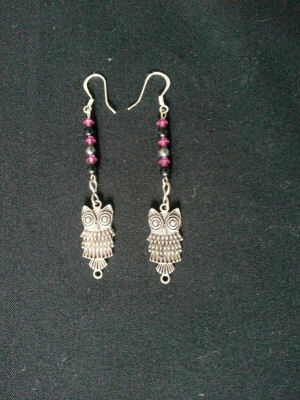 And OMG…#7 (the owl earrings) are fab-u-lous! I don’t know whether you knew this, but owls are one of my favorite birds. Not only do I find them beautiful, but I also find them a very mysterious bird. Well done, my friend! You are very talented in SO MANY ways! P.S And speaking of storms, we’re expected to get one tomorrow and through the next couple of days. In fact, it just started to rain. Ron, those are lovely words of praise, and I appreciate hearing them! You love owls, too?? I think they’re wonderful. Mysterious, yes, but they look so wise. I know the Harry Potter books were filled with owls, but I don’t consider them a witch’s bird. Have you seen the YouTube video (https://www.youtube.com/watch?v=_RBNpALibqo) with the owls being petted? Why, they look almost like they could purr, ha! We had that nasty rain, too. I’m sorry you’re going to have a few days of it, but at least you’ll be at work, huh? Here’s hoping it clears up for your weekend! Thanks, as always, for being a dear and dropping by — have a fabulous week!! You got Bear? How awesome is that! I’ve always been partial to bears (the teddy bear variety, especially), and I’m most impressed that you just naturally gravitated to bearpaw jewelry! Maybe there’s something to this totem thing, after all!! I’m so glad you like them, FF! Lots of women prefer something smaller, but I, too, am partial to dangly ones. If I’m going to bother with earrings, I want them to be noticed, ha! And I love that you love my owls! If I were to wear a pair, it would be the next-to-last, with the single crystal and the silver beads. Simple, and elegant. I do like the ones with the owls — funny that I just told you over at my place about solar-powered owls for keeping other birds off boats! I’m glad to see you’re still doing this. I always enjoy seeing your creations — they never seem repetitive or dull. 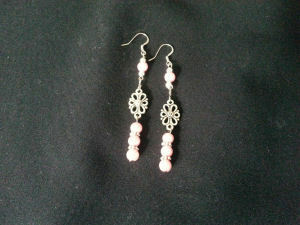 And they never seem overdone, either – which can be a problem with some of the dangly earrings! Such lovely compliments, Linda — thank you! Dangly earrings aren’t for everybody, I suppose. Until I started making them myself, I rather thought classic studs (pearls, diamonds, etc.) were the way to go. Now, I tend to think of jewelry as an expression of creativity — and it always warms my heart when a stranger asks if my stuff is for sale anywhere. Maybe one day…. So many pretty pieces. Love the Owls. And the bracelet is beautiful and fun. I am usually very fond of Gemini’s so maybe that is why I am drawn to it. Thanks, Katybeth. I’m glad to “meet” another owl-lover. Aren’t they just the most interesting birds ever?? One thing I love about the bracelet — besides the colors, of course — is the way it feels. So cool and smooth. I’ve found it really does evoke a calmness, too! Why, thanks, Luv! Glad my “sparkles” brightened your day. Love you always!! Aw, gee, Monica, you’re sweet to say so — thanks ever so much! !